View cart “CarCapsule 20′ Tall Outdoor” has been added to your cart. 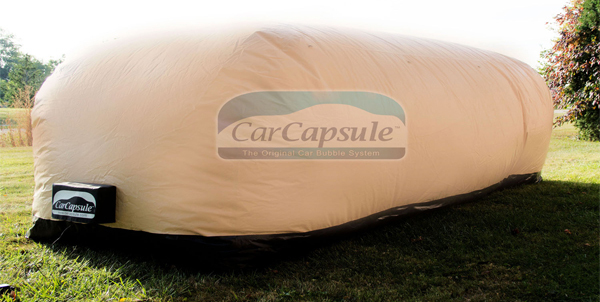 The outdoor CarCapsule is a “bubble” that completely covers and protects your vehicle from dings, dirt, dust, corrosion, mildew, musty odors, rust, rodents, and even fingerprints that slowly turn it from new to old. • The CarCapsule warrants the original owner for a period of 1 year for defects on materials and workmanship under normal and intended use. • Using the indoor CarCapsule outdoors will void warranty. • The CarCapsule will be repaired or replaced at CarCapsule USA’s sole discretion, without charge, to the dealer from whom the CarCapsule was originally purchased, freight prepaid. • CarCapsule USA hereby disclaims all other express warranties. CarCapsule USA hereby disclaims all implied warranties, including warranties of merchant ability and use for particular purpose to the extent of the law of the state and federal law allows.